I started writing this series 6 or 7 years ago with students in mind. I wrote about what I predicted would be the coming tidal wave of university entrepreneurship and did a Ted talk about what a great opportunity students in this era have to try their hand with startups. The tidal wave has arrived in full force by now. Below is also a seven-step series of exactly what students "need to know" to be successful as they approach the world of startups. Hope you enjoy and find it useful! As I sometimes like to say- if the licensing side of the university tech transfer business is 29 years old by now, the practice of spinning-out companies based on university intellectual property is still really a teenager. The field is still young enough such that no one has written the definitive book on its application and in the meantime the field simply continues to evolve and grow at a stunning pace. And, like any teenager worth his or her salt, this form of university entrepreneurship is becoming increasingly boisterous, ambitious, somewhat unruly at times and yet is displaying enormous creativity, energy and imagination. As I approach the beginning of my fifth year in the university and with the benefit of having spun-out almost 50 university startups during this period, I have taken a moment to reflect on what I have seen and am seeing occur. According to AUTM statistics, American universities are now spinning-off companies based on university intellectual property at a clip approaching 600 per year. In addition, as demonstrated in a recent white-paper authored by a team led by MIT's legendary Ed Roberts, this number of 600 per year is actually dwarfed by the thousands of other companies being launched each year by university entrepreneurs forming companies of their own that are not based on their university's intellectual property. Another important development is the well-known fact that as the costs of launching a company continue to decrease due to the advent of cloud computing and the like- so has it steadily become much easier for university-age students to try their hand at entrepreneurship. Over these past four years I have also observed more and more universities rising to the challenge of empowering and enabling their populations of fledgling entrepreneurs. More and more schools are offering entrepreneurship education and lectures, and setting up divisions run by experienced entrepreneurs/investors and as a result we are seeing new programs bubbling up everywhere. It is now increasingly common to hear about various university programs offering entrepreneur office hours, seed-funding competitions and new entrepreneur-in-residence and/or venture mentorship services. Amazingly, such programs were the exception and not the rule when I first arrived on campus some four short years ago. There are perhaps two other factors at play in this ether. The first I call the Facebook Effect. With the mythology of its dorm-room provenance looming archetypally over the consciousness of almost every new student venture, we have in place now the much needed "success story" to inspire legions of young entrepreneurs. Secondly, due to the prolonged economic downturn and decimation of the job market, more and more students now find it perfectly reasonable to explore the startup avenue than ever before. My TEDx Talk for Student Entrepreneurs: "Why Wait 'Til You Graduate?" I gave a TEDx talk on student entrepreneurship in November of 2011. It sort of sums up how I feel about the extraordinary opportunity student entrepreneurs have at their disposal in this day and age. I contrasted the environment of 25+ years ago (when I was a college freshman) versus that of today for a fledgling student entrepreneur. I've had the privilege of mentoring lots of student entrepreneurs over the past years and based on this experience I've decided to lay-out the roadmap I believe every student entrepreneur ought to have in place in the interest of increasing the chances of seeing their venture succeed. 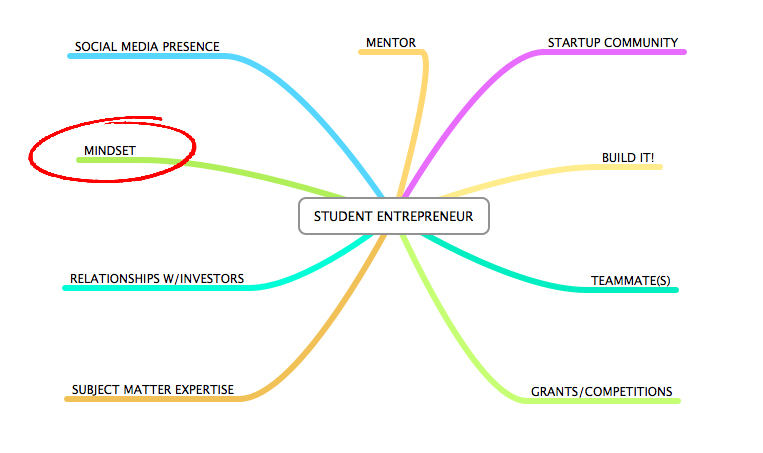 The map above (which I shall be improving upon over time) lays out the major high-level ingredients required to maximize success for a student entrepreneur. In this mini-series of posts I'm going to flesh-out each step in more detail. But actually, I want you win. That's right- I said it here. Just win, baby. In the first post in this series I encouraged you to take stock of where you are and to understand your unique position in world-history as a student entrepreneur. Your awareness of the surreal advantages you have over every student entrepreneur that has come before you is massively important. So let's assume that this has sunk-in. Now what? Very simple. All the folks on the side-lines have been talking about startup bubbles these days. How about your own bubble? That's right- how about getting out of the bubble that you are in. What do I mean? You need to dive into the startup community of your city or town wherever you live. Get a list of all the events each Monday morning and go to as many as you can possibly attend. Meet everyone, be friendly- have fun and get involved- don't be a wall flower. The best way to get to know people is to work with them and engage. So, I'm talking about you jumping all over the various meetups, hackathons, startup talks, startup weekends, lean startup competitions, entrepreneurship talks, conferences, cocktail parties, entrepreneurship weeks, breakfasts, dinners, societies, roundtables available. When I tell students to do this, some say: "But what do I say to people when I'm there? ", or "I don't really know anyone, it's a bit intimidating". Actually- the reality is that the startup ecosystems are an incredibly welcoming and warm environment. People in the startup community aren't a bunch of uptight careerists decked-out in suits. For the most part it's comprised of people like you who want nothing to do with corporate personalities and environments. If you're a student they're typically extra-welcoming. Just be honest and tell folks you are a student and are diving-into the startup community. You'll typically get high-fives. And remember- the key is this: Roll-up your sleeves and participate. Pull an all-nighter at a hackathon with a makeshift team, sign up for a leanstartup competition, present your un-baked ideas at incubation events. Before you know it you'll know everyone and they'll know you. You'll feel that team spirit and esprit de corps and it will change you forever. You'll be out of the campus bubble now and will be part of the world you need to know intimately if you want to be an entrepreneur. In the previous posts in this Series we established the mindset and awareness required as well as the immersion you need to initiate in your local startup ecosystem in order to greatly increase your chances of success as an entrepreneur. In this post we are focused-on developing subject-matter expertise. So let's elaborate on what I mean by this. If you're an undergrad perhaps you've already declared your major/minor, etc. and if you're in grad school you're already something of a specialist. So there's no question you're developing some serious knowledge. But that's simply not enough and you should refuse to rest on the laurels academia might bestow on you. It means close to zilch in the business world and often leads to insane disconnects when the two worlds collide. This cultural divide only deepens over time and believe me, I've seen it over and over again. Don't ever let it get to this. With some extra effort you can "change the game" completely. If the sort of businesses you're thinking about launching one day happens to spring from the subject matter you're studying in school, that's definitely a "leg-up" so to speak, but don't be lulled into complacency by thinking you've got the space figured out. I meet plenty of grad students who are deeply intimate with a field of research, but this simply doesn't come close to knowing what they need to know. Who are all the established companies and startups in this space (historically and now) and what happened to them and why? What were and are their business models? Who are all the successful entrepreneurs/teams in this space? How did they achieve what they achieved? Where are they now? Who are the entrepreneurs & teams that failed and why? What is the customer base in this space like? How is it segmented? Who are the key investors in this space and what are they looking for? Where is the industry moving? Where are the white spaces, the unsolved problems? Who are the best writers/bloggers/journos giving the most unique insights into the space? What are the best events/gatherings/conferences in the field where everyone gathers? I guarantee you that if you master all of the items above you will be absolutely unique among your peers. Amazingly very few people actually even know to do this in the first place but even if they do they usually don't pursue it for whatever reason. If you are one of the few that develops this subject matter expertise you will have achieved fluency in a new language and everyone in the business world you encounter will immediately recognize this. Now You'll have Subject Matter Expertise! In the previous posts in this Series we established the mindset and awareness required as well as the immersion you need to initiate in your local startup ecosystem, and what you need to do to acquire subject matter expertise all with the objective of greatly increasing your chances of success as an entrepreneur. If you're in this to win this, you need a robust online presence because entrepreneurs are only as strong as their networks. A strong online presence comprised of an active blog and/or twitter presence, etc. is simply mandatory in the world we're living in. Everyone's online, everyone will be looking you up online and if you're not there when they look- or hard to find- you essentially don't really exist. That's the opposite of what you need to have going for you if you aspire to running a company where you'll be depending on the good graces of a multitude of people including customers, service providers, potential partners, online tools, investors, etc. Work in obscurity and you're company will most certainly fail. This may be the highest hurdle of all for most people. It is the virtual equivalent of the real world aversion certain fledgling entrepreneurs have about actually speaking to potential customers. Here's the thing- don't worry if you're not a subject matter expert in your field yet. The cool thing about a blog is you can write honestly about what you are actually going through. Turn your perception of what blogging is about on its head and think of your blog as an actual vehicle to learn about areas that interest you! For example, as you study the topic, why not post about certain things you have learned, about articles or books you have read, about lectures or conferences you have attended! Take photos and post those along with your written content. Be insightful, thoughtful, original. Before you know it your blog has become a workspace for you. Get a blogroll of all the blogs you follow, archive your posts and categorize them. Have fun with it and be authentic. In time, you won't ever look back. As busy as you feel you are, you'll actually never have as much freedom (read: time) on your hands as you have right now. You probably aren't married yet, don't have kids yet, don't have a full-time job, etc. Obviously there are certain students who do have difficult situations on their hands and concommitant obligations and I'm not disrespecting anyone in this situation. But if you are not burdened by such obligations, then the real problem is probably that you are just not cut out for entrepreneurship. I know that *sounds* harsh, but it really isn't. If you aren't prioritizing the things that give you every advantage possible as a fledgling entrepreneur, your heart's probably not in it. And if this stuff isn't making sense and seems like a burden to you, that's totally fine, but I think it may be best for you to start thinking about getting a job somewhere. In the previous posts in this Series we established the mindset and awareness required as well as the immersion you need to initiate in your local startup ecosystem, what you need to do to acquire subject matter expertise and how to develop a social media presence all with the objective of greatly increasing your chances of success as an entrepreneur. Next on the menu is understanding the importance of mentorship. Take a second to remember what is was like when you first started trying to learn a new language, sport or skill. It was probably somewhat daunting and uncomfortable at first. Perhaps you found a great coach to quickly help you get the hang of things that gave you real-world insights that you never would have found in a book. I suggest you look at learning entrepreneurship in the same exact way. It's really not something one "just does" and hopes to be good at. You need experienced people to help guide you so you can avoid major pitfalls. The sooner you accept this reality, the better. Having an ego about this is a mistake. Don't confuse being intelligent with actually knowing anything- it's a huge problem that's rampant in our society. The good news is that most colleges and universities are being swept up in the tidal wave of university entrepreneurship I predicted three years ago! Whether the school's administration is genuinely interested in helping student entrepreneurs succeed or just "trying to keep up with the Jones' (and the Stanford's for that matter)", doesn't matter much, because they're all falling over themselves to find entrepreneurs-in-residence and start mentorship programs to point their students to. I strongly urge you to take advantage of these resources and to receive some ongoing advice and mentorship. Also, as you immerse yourself in the local startup community, keep your eyes open for experienced and successful people who might be inclined to help you. Perhaps they went to the same college as you did or simply love what you are trying to create. When you find such a person, get to know them and take your time- don't clumsily ask them to mentor you on your first or second meeting. Let it happen organically. Usually the conversations will just head in the direction of advice and mentorship- all you need to do is roll with it at that point! In a nutshell, finding a solid mentor can dramatically increase the chances of you succeeding, so get out there and see what you can do about it! Here's some additional posts I've written in my Series on Mentorship that you may also find to be helpful. In the previous posts in this Series we established the mindset and awareness required as well as the immersion you need to initiate in your local startup ecosystem, what you need to do to acquire subject matter expertise, how to develop a social media presence and the importance of finding a mentor, all with the objective of greatly increasing your chances of success as an entrepreneur. In the second post in this series I encouraged you to immerse yourself in your local startup ecosystem so as to get out of that "school bubble" and into the action. I am going to elaborate here, specifically with regard to cultivating relationships with angel and venture capital investors. OK, so with that caveat in mind, one layer of the ecosystem is of course comprised of investors and they are an important one. Whether your startup ends up requiring friends & family money, angel money or VC money is immaterial. Rest assured it will require some money and having real relationships with investors will be crucial whether you try to raise money from them in the future or not. So how do you get to know investors in a natural way? First, you need to identify them. One way to start is by checking the various profiles of the various angels and VC's (who invest in your space). Today Angellist is the best source of all. Second, you should begin to familiarize yourself with their portfolio companies, their investment philosophy via their blogs and twitter streams and through this process identify a handful that you think you would have a natural rapport with. You can then start commenting on their blogs (not pitching them mind you!) and start participating naturally in the dialogue. Share and learn! Next you should identify where they are going to be speaking or what events they will be attending. Be there. Since you've been interacting with them on their blogs and twitter, etc., you'll have a natural way of saying hello and you can simply continue the virtual conversation you've been having in person. So now you'll be developing real relationships with angels and VC's in your area. Remember, you are not pitching them. They are real people like you and often have a lot of experience and can be great sources of advice. It also just so happens that they invest in lines, not dots as Mark Suster likes to say. Get to know each other! With this approach you'll be connected in no time. Let me know how it goes! In the previous posts in this Series we established the mindset and awareness required as well as the immersion you need to initiate in your local startup ecosystem, what you need to do to acquire subject matter expertise, how to develop a social media presence the importance of finding a mentor, and how to cultivate lasting ties with investors, all with the objective of greatly increasing your chances of success as an entrepreneur. In this installment, I'm going to highlight the fact that among the many awesome advantages you have as a student entrepreneur, (your sheer youth, the spare time you have, your .edu address, the willingness of most people to help you, your freedom to operate, etc.) is the fact that you can apply for a staggering array of competitions and grants geared specifically to student entrepreneurs like yourself! The opportunity is so remarkable I thought it deserved its own special category in this Series as I see it as separate and apart from raising capital & investors. You see- what we're talking about in this post is non-dilutive capital! Another more colloquial term for it is of course, "Free Money"! Over the years I've seen the student entrepreneurs with the most hustle consistently figure out ways to enter into a plethora of competitions and apply for student grants while they are still in school. Oftentimes the money and in-kind services they receive for winning such competitions and grants are actually the critical funding they needed to achieve proof-of-concept or product-market fit for their businesses. It would have been very tough for them to raise angel or VC money at the stages they were in, but that $25k or $50k they won made all the difference. In fact, a number of great businesses got their start this way, including mammoth venture-backed companies like Comixology, LearnVest, Warby Parker and Pinterest. So do not hesitate to avail yourself of the myriad of resources, competitions and ignition grants available at your university and beyond. In the meantime, I wish you lots of luck- hope you pull down some wins here. Go out and get-em!